The early press and narrative around The American Dream tried to position it as satirical social commentary. But it's not that. It's a publicity hook and a tired joke that gets stretched too thin for too long. In this version of 1950's Americana, guns are used everywhere and for everything. Want to play catch with your dad, don't toss the ball back, shoot it from the sky. Menial tasks likes signing checks or opening cans are done with a bullet. 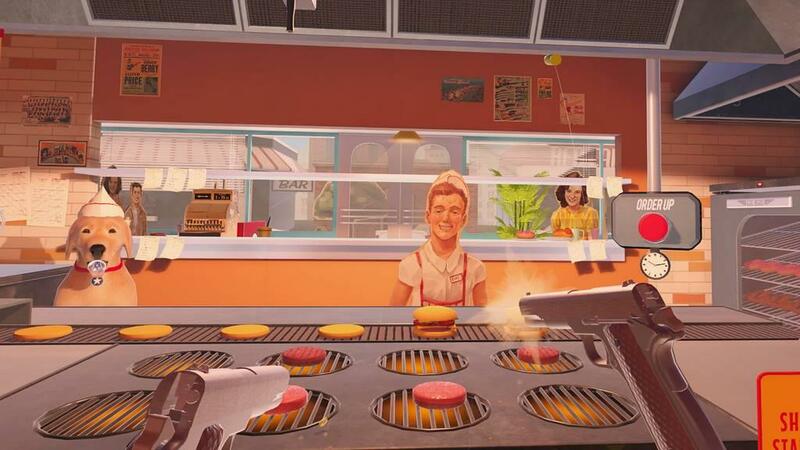 Guns replace hands for everything from pushing buttons to handling food. The only problem is, none of these bullets or trigger pulls have any consequence. 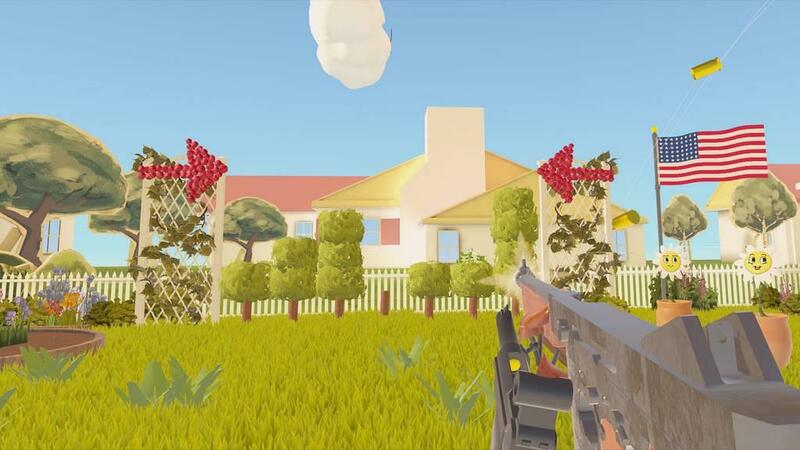 The only entities that exist in The American Dream's game world are the player and a series of inanimate objects and things to target. There is no right or wrong about the use of the weapons when there is no consequence to any actions. It's a shame, because underneath there is a pretty decent shooting gallery to play here featuring pistols, rifles, machine guns, shotguns, and dance moves. Reloading is even a blast as magazines eject into the air and time slows to pluck the clip mid-flight directly into the pistol grip. When's the last time you played a game where reloading was fun in and of itself? And the 50's era nostalgia works very well. 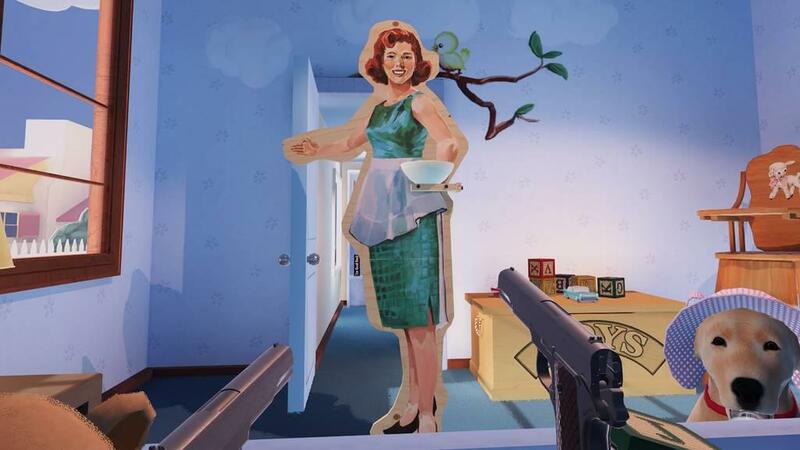 The game has a distinct look and feel and despite the fact that every character is a plywood cutout of a person, it all comes together nicely. I do have some minor gripes around the wonky mechanics surrounding scoping with the rifle, the two handed motions required to reload the rifle and to an extent the tommy gun as well. Come to think of it the rifle mechanics in general just needs more polish. The scope is way to jumpy, the hit detection on trying to slip in the magazine is all over the place, and the experience of holding a large, rigid, two handed weapon just doesn't translate to a pair of independent motion controllers. But my major gripe really is with the game's pacing: it is far, far too slow. Way too many times did I find myself completely off track of the narrative as the narrator would drone on and on but give the player nothing to actually do in the meantime. I'd be trying to bide my time scanning the room for something, anything to divert my attention. There are bonus targets in each level to hunt down tucked away in far corners, but mostly I'd just be shooting random objects just to see if the impact would instigate a physics response and actually move them. My report: bottles mostly yes, everything else mostly no. I encourage you to do your own experimentation because you'll soon find out there is a lot of dead air in this game to fill. It also needs be said that there is one very, very insensitive scene when in the chapter around age 23 and watching the television that basically tries to excuse school shooters. I think the developers were trying to be clever in this moment by matter of factly positioning a news report more or less in favor of the rights of a shooter; but it doesn't come across in any way but completely tone deaf. It is such a bad moment for the game that I honestly think it's a mistake releasing it in it's current state. It's worth missing a deadline just to correct how badly it plays out. There is nothing clever about it, it's not satire, it's not even controversial, and it's not worth playing the game just to see it. It's just in bad taste. It's an annoyance for the running joke to fall flat and go on for too long, it's frustrating to miss the mark on pacing, but it's where the game gets tone deaf in that moment where I just lose interest and find that I don't care if I end up recommending it or not in the final verdict. There are games I feel passionately about and despite their flaws I want people to play. But after the television scene, I'm just not bothered by The American Dream anymore and I don't want to spend any more time on it. Which is a shame because the best bits of the shooting gallery are a heap of fun. 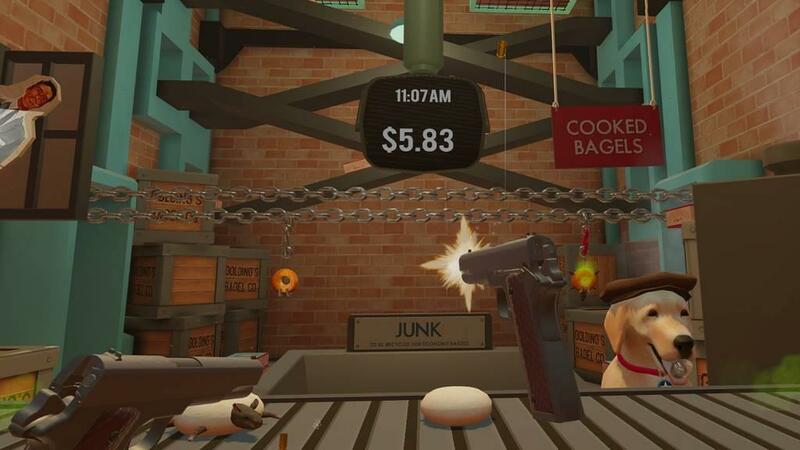 Once you wade through the pacing and get to the parts where there is a lot going on, specifically the bits where the narrative gets lighter and the action picks up such as working the various jobs form flipping burgers to operating a car wash or running quality control in the bagel factory, it reveals an excellent core gameplay loop. Those rare moments where the game is moving fast and not trying to shoehorn in yet another awkward joke about gun use or long exposition form the narrator, it just takes off. Honestly, double down on those sections, move through the narration much more quickly, keep the 50's style and direction as is, and just give up on the social commentary; now there is the potential for a great carnival shooting gallery. All the elements exist already, there's just a lot to wade through to pick out those isolated moments when it comes together. At the end of the day, the narrative hook The American Dream tries to position itself on does more to detract from this game than enhance it. It does nothing to spark a conversation, is far too over the top to pose as a commentary, is completely tone deaf on occasion, and goes on for far too long. It's not a precise scalpel to cut to the heart of the debate, it's a blunt instrument to bludgeon you with cliches over and again. If you want to sit through some clever dialog about American gun culture from an Aussie, open up Netflix and watch some Jim Jefferies. 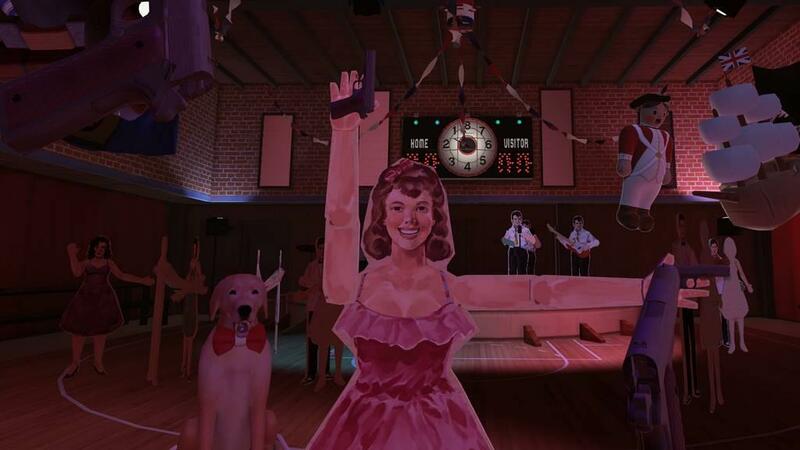 Once you get past the hook in The American Dream, there is a decent VR shooting gallery to enjoy; but even that is derailed by the pacing, with the best bits too few and far between.